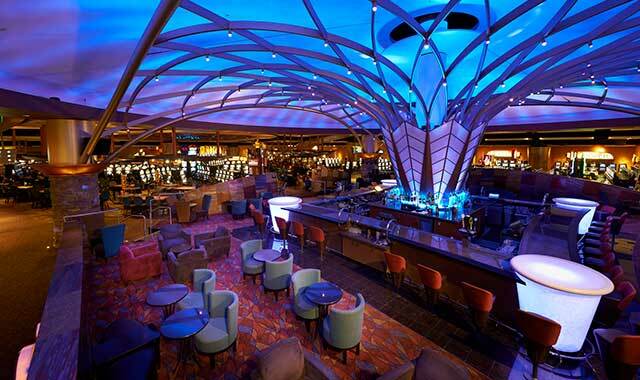 The colorful Bar 360 at Potawatomi Hotel & Casino, in Milwaukee, sits in the center of the gaming floor. It’s one of eight spots to enjoy drinks and food. It was no small gamble in 1991 when the Forest County Potawatomi tribe set out to build an off-reservation casino in a blighted Milwaukee neighborhood. But over nearly three decades, Potawatomi Hotel & Casino has hit the jackpot, growing from a modest bingo hall into one of the nation’s largest tribally owned casinos – and an important player in Milwaukee’s urban renaissance. True to the Potawatomi tribe’s values, this casino is not only enjoying its new riches, but spreading the rewards of its success with the Milwaukee community and increasing waves of visitors. Boasting more than 1.1 million square feet of total space, Potawatomi Hotel & Casino maintains a gaming floor with some 100 table games, 20 poker tables, 3,000 slot machines and 1,350 seats for bingo, in addition to eight dining options and lively entertainment venues that welcome big-name performers. An adjacent 19-story hotel, opened in 2014, features 381 rooms and suites, with additional amenities for social events and business meetings. Creating one of the Milwaukee area’s top destinations and one of its largest employers was far from mind when Milwaukee’s Indian Community School approached the Potawatomi nation about opening a bingo hall to help the school through hard financial times. Thanks to the federal Indian Gaming Regulatory Act of 1988, native tribes and reservations, which act as their own sovereign governments, had just received access to new revenue opportunities through casino gaming. The tribe settled on a location in Milwaukee’s Menomonee Valley neighborhood, what was at that time a decaying industrial area. Crowds flocked to the bingo hall and its slot machines, added in 1992. Gaming became a 24/7 operation and in October 2000, Potawatomi opened a three-floor, 250,000-square-foot expansion with room for slots, table games, bingo, dining and live entertainment. Over the next several years, Potawatomi welcomed a new poker room, two 500,000-square-foot expansions, and a new parking garage. As demand grew, casino leaders realized they were missing a key element. So, in 2012 ground was broken on a $150 million hotel connected to the casino. When the 19-story hotel tower opened in August 2014, gaming fans took notice. Its 381 guest rooms, including 16 lavish suites, provide floor-to-ceiling windows with sweeping views of the Milwaukee skyline and Lake Michigan. In recent years, an estimated 6 million people have visited the hotel and its casino each year for gaming, tourism, business meetings and weddings. Answering to continued consumer demand, Potawatomi Hotel & Casino is growing again, this time with an $80 million, 119-room addition to its hotel tower. By the time construction is complete next spring, Potawatomi will be the city’s second-largest hotel, with 500 rooms, says Ferguson. Potawatomi Hotel & Casino now sits on a full two city blocks surrounding its original bingo hall. The casino’s continual growth has proven a boon for its neighborhood. The casino’s popularity has brought new prosperity for its owners, the Forest County Potawatomi tribe. The casino is the tribe’s largest revenue source because, by law, it can’t generate taxes on its 12,000-acre reservation in northern Wisconsin. While the casino supports the tribe, the tribe is quick to share its newfound wealth with the Milwaukee community. Since 1994, the promotional Heart of Canal Street games have helped to raise nearly $18 million for area children’s charities, including Big Brothers Big Sisters, Milwaukee Youth Symphony Orchestra, Ronald McDonald House, and various community centers. Last year, Heart of Canal Street bingo games raised some $1.1 million that was shared among nearly 30 local organizations, including Safe & Sound, a nonprofit that helps to improve neighborhoods by increasing dialogue with civic leaders, the police and neighbors. Potawatomi’s 2018 promotion launches this fall, with beneficiaries still to be announced. Ferguson has worked with eight other casinos over his nearly 35-year career, and he believes Potawatomi’s emphasis on giving back stands out among the crowd. But he also knows the hotel and casino’s growth is no accident. He believes it’s Potawatomi Hotel & Casino’s savvy staff and their attention to customers that provide powerful tools for growth. This entry was posted on Tuesday, May 1st, 2018 at 11:58 am	and is filed under Northwest Business Magazine. You can follow any responses to this entry through the RSS 2.0 feed. Both comments and pings are currently closed.